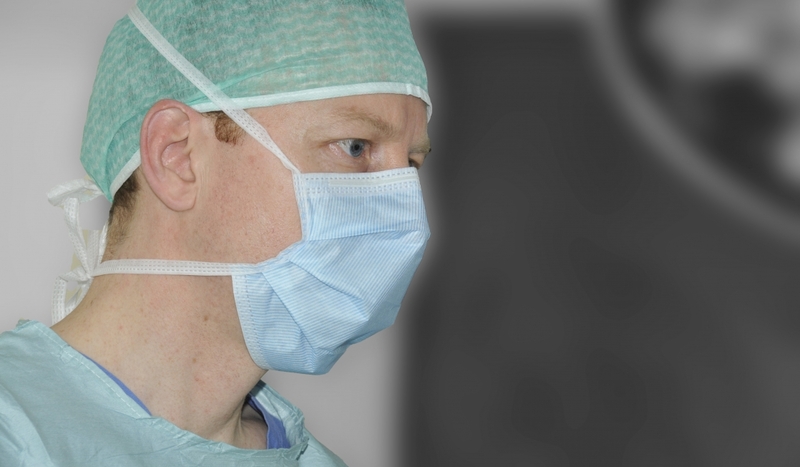 As a specialist in achalasia, Mr Clarke follows current national and international guidelines (see resources), using up-to-date investigation techniques, as well as keyhole (laparoscopic) surgery. Achalasia is a disorder of the gullet (oesophagus) in which the muscles fail to move food along properly and the valve at the lower end of the oesophagus fails to open, preventing food passing into the stomach normally. It is an uncommon condition that is diagnosed in 1 in 100,000 people annually, affects males and females equally and is commonest between 30 -60 years of age. Damage to or loss of the nerves in the wall of the gullet (oesophagus). The underlying cause for this remains largely unknown, however there may be some association with certain viral or autoimmune conditions (in which the immune system attacks healthy cells and tissues). In patients with achalasia there is thought be an increased likelihood of developing oesophageal cancer in the future. The commonest symptoms include difficulty swallowing (dysphagia), pain on swallowing and/or regurgitation of undigested food after meals. In some patients this can cause choking, coughing , heartburn or weight loss. In some patients there may be no symptoms and it is incidentally detected during investigations for other diseases. A thin telescope is passed via the mouth using local anaesthetic and/or sedation to inspect the gullet (oesophagus), stomach and duodenum. A white dye containing barium is swallowed and its movement along the gullet towards the stomach is videoed using x-ray. This is the gold standard investigation for achalasia. A thin tube is passed via the nose and a series of pressure measurements are made whilst the patient swallows small sips of water to assess the function of the gullet (oesophagus). Current recommendations are that graded pneumatic dilatation or surgical myotomy are recommended as initial treatment for those fit and willing to undergo these procedures. Injection of botulinum toxin is recommended for those patients not suitable for dilatation or surgery. Medication is recommended for those not suitable for dilatation or surgery and in whom botulinum toxin injection has failed. Under sedation or a full general anaesthetic, a balloon (3-4cm in diameter) is passed into the gullet (oesophagus) via the mouth. Under x-ray guidance it is inflated to stretch and disrupt the muscles of the valve at the lower end of the gullet. This may need to be repeated after one or more years. There is a risk of rupture of the gullet that may require surgery (around 1 in 50 patients). Once a decision is made to go ahead with surgery, you will need to attend the pre-assessment clinic, at which a number of routine checks and blood tests will be performed. Surgery is performed with keyhole (laparoscopic) surgery. Five keyhole incisions are made in the upper part of the tummy (abdomen). The operation involves dividing the muscles (myotomy) of the valve at the lower end of the gullet that fails to relax. The top section of the stomach (fundus) is then stitched across this divided valve to prevent acid or food regurgitating back from the stomach into the gullet. This is known as a ‘fundoplication’ or ‘wrap’. The procedure normally takes 1-2 hours. Patients are normally ready to be discharged the following day after surgery. You will be discharged with painkillers and written post-operative instructions. All stitches are dissolvable. The waterproof dressings are suitable for the shower and can be removed after 7 days. You are advised to drink fluids only for the initial 24 hours after surgery before commencing a mashed diet for the following 3 weeks. More solid foods can then be gradually reintroduced as tolerated. Recovery can take around two weeks however you are advised to avoid heavy lifting for up to 6 weeks after surgery. Infection – This may affect the wounds, lungs or site of intravenous lines. Diarrhoea – some patients develop diarrhoea following surgery, the cause for which is not always clear. This may require management with medication to control. Dysphagia – difficulty swallowing is relatively common in the initial post-operative period but normally improves by 6 weeks. In rare circumstances it may persist longer than 6 months and may require further intervention. The muscle at the lower end of the gullet (oesophagus) can be relaxed using medications such as nitrates or calcium channel blocker drugs (e.g. nifedipine). These may provide temporary relief and are not effective in all aptients. Botulinum toxin is injected painlessly into the muscle of the valve at the lower end of the gullet (oesophagus) via endoscopy. This can be effective for a few months to years.